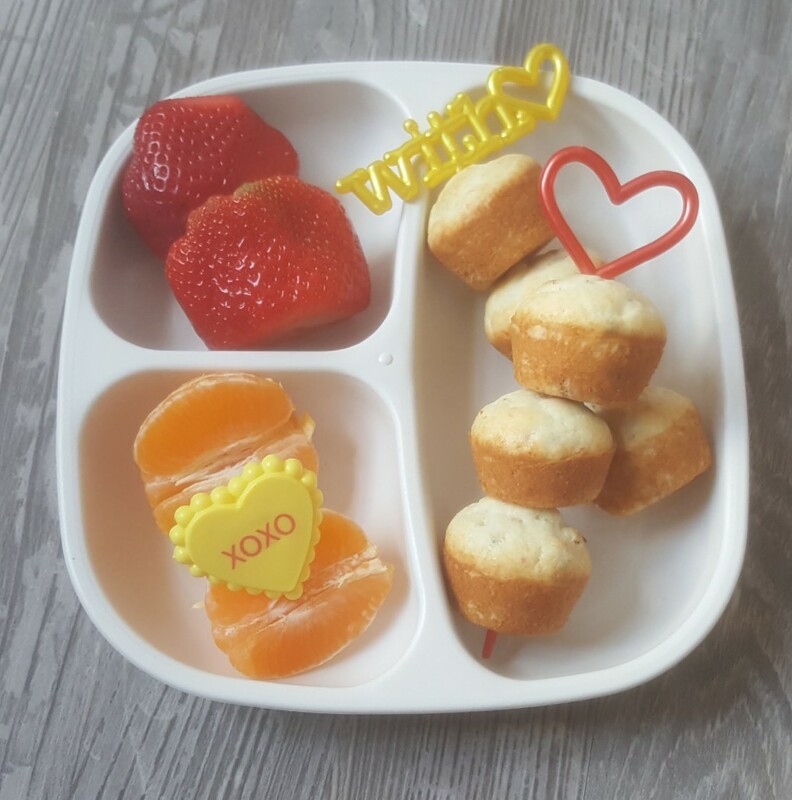 In this post, I will share eighteen Valentine’s Day/Love themed lunches as well as a couple of breakfasts. Some of these were packed recently and a few were from three to five years ago. I have hundreds of never-blogged lunch photos saved to Google Cloud so I pulled a few out for this post :). First up is a lunch packed for this week. 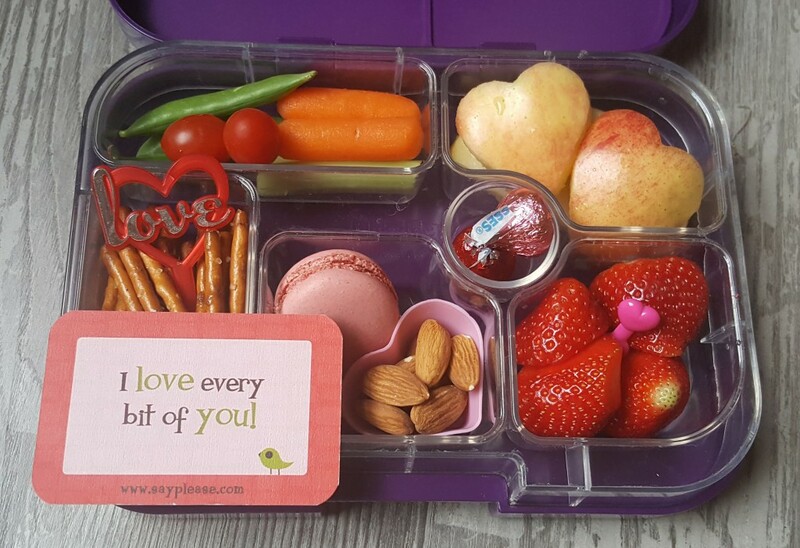 It is packed in one of our Yumbox lunch boxes. You will see a lot of these in this post and on my site because I love using Yumboxes. 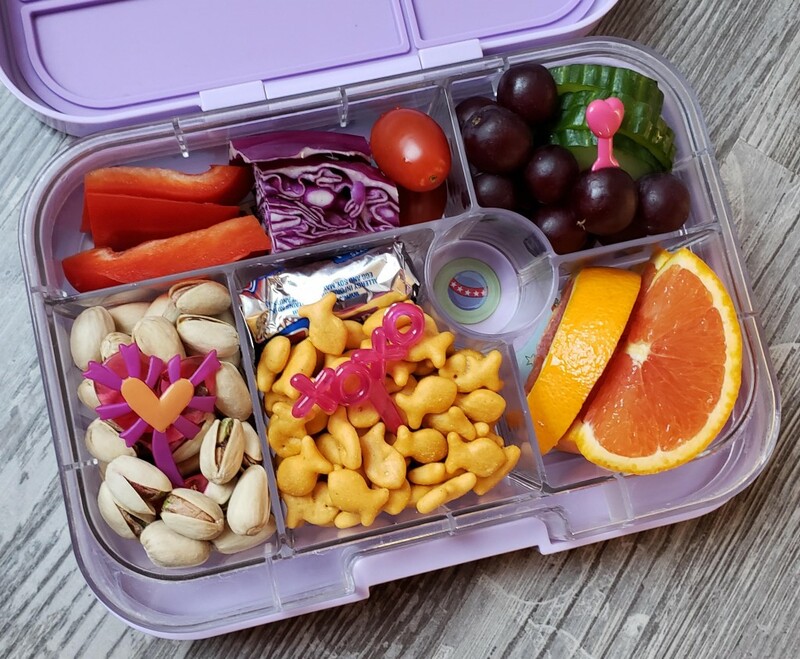 The compartments make lunch packing easy, the sealed silicone lid keeps each section separate, and the latch is easy for my kids to use. This lunch contains cookies I saved from our last trip to an IKEA. 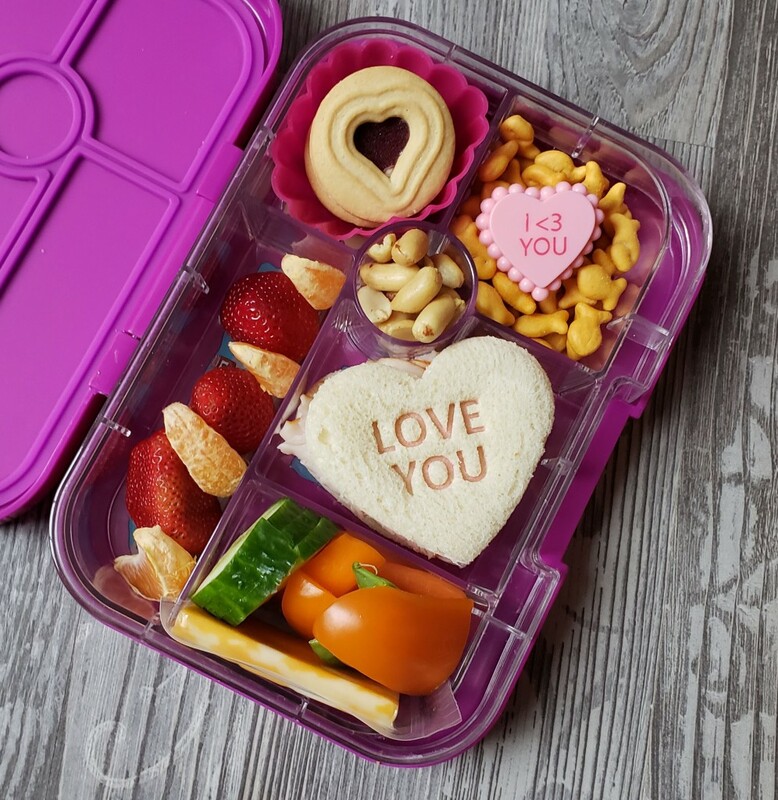 These cookies taste good and fit perfectly in a Valentine’s Day themed lunch. 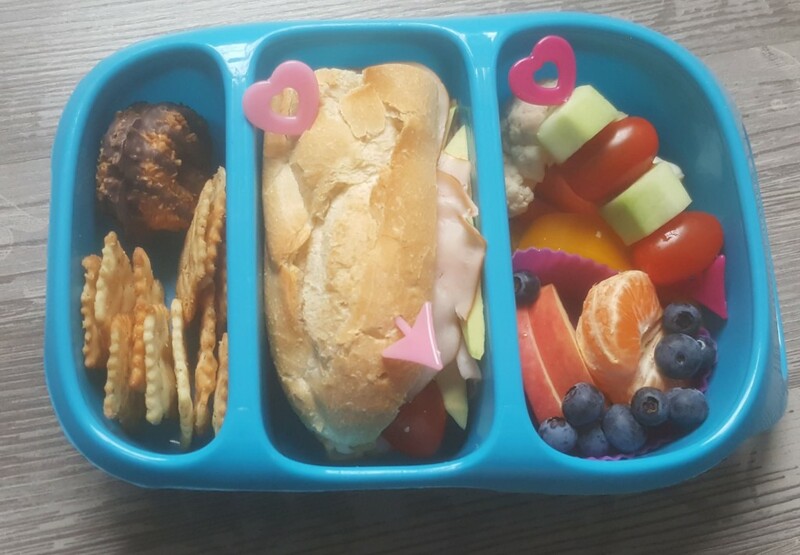 Next, is a lunch my daughter had last week. 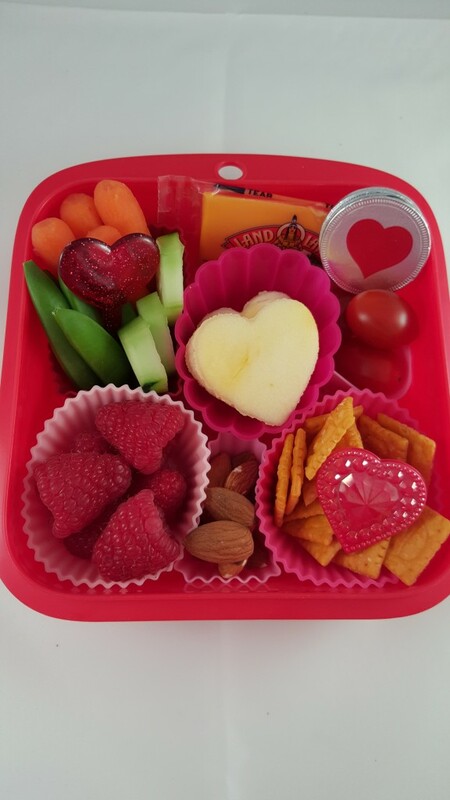 I have been able to find some beautiful, delicious strawberries recently and they look great in loved themed lunches! The lunch below is from a week or so ago. I finally found some decent green grapes. They have been hard to come by in our area this school year. The lunch below is one my son had last week. Finding protein that he will eat at school is tricky. 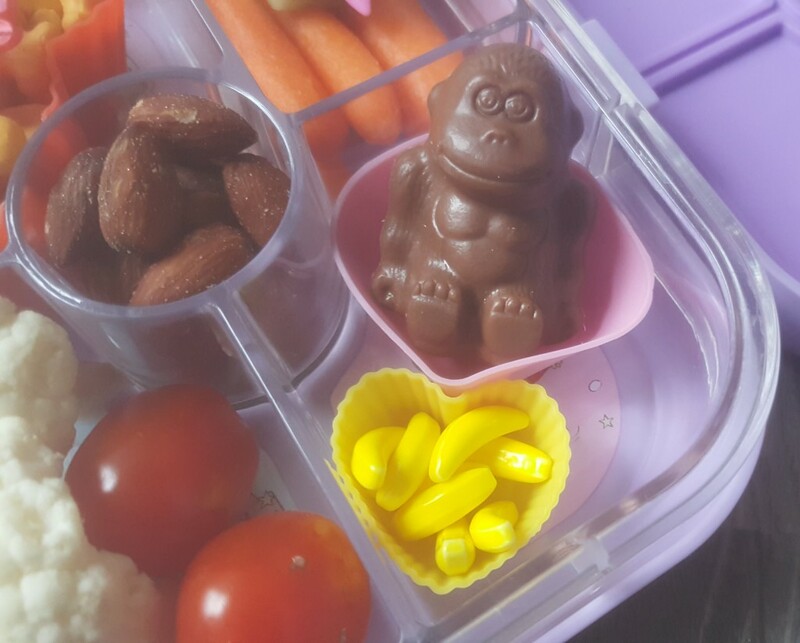 Recently, he has enjoyed cracking and eating pistachios so I included those in this lunch. 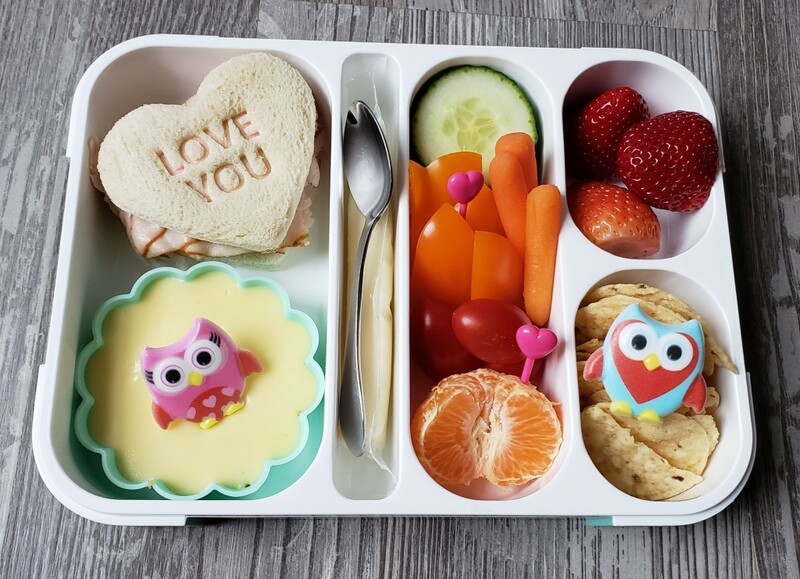 Below is a lunch my daughter had last week. You can see that it and the lunch above both included red cabbage. 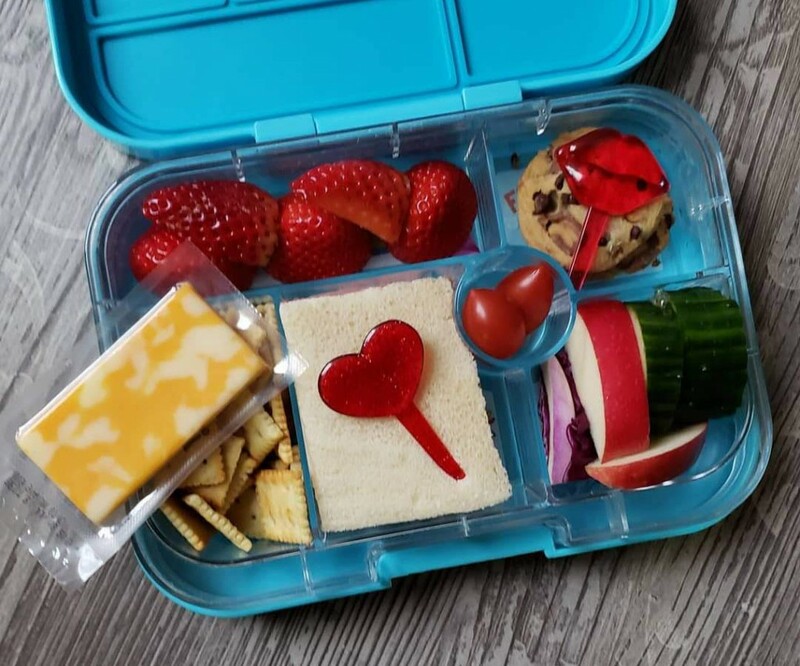 My kids like that and I try to include it a few times a year to add some variety to lunch time. (Plus, I always think it looks really pretty in photos :)). The next lunch was themed on the city of love. It was for my daughter who hopes to travel to Paris one day. 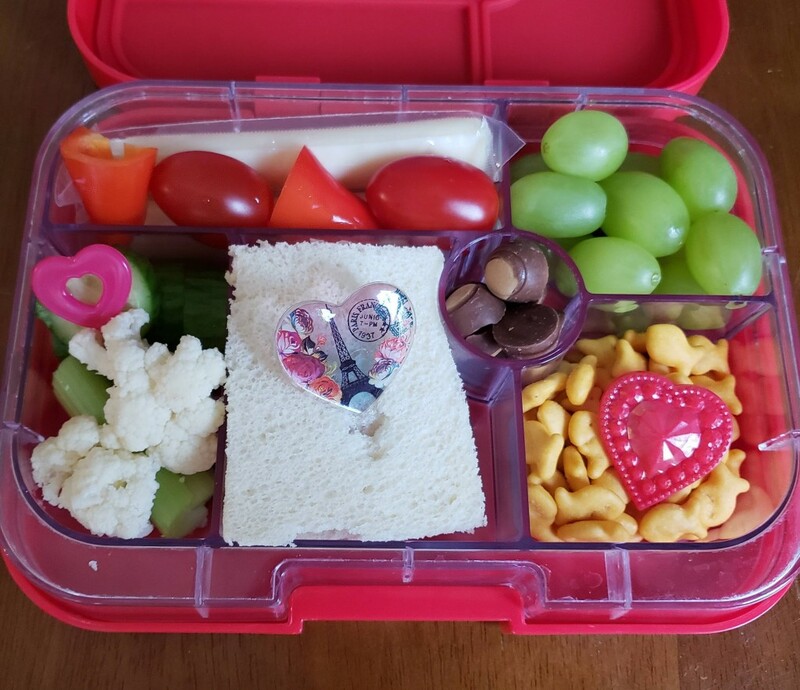 The lunch below was packed a couple of years ago for my daughter. 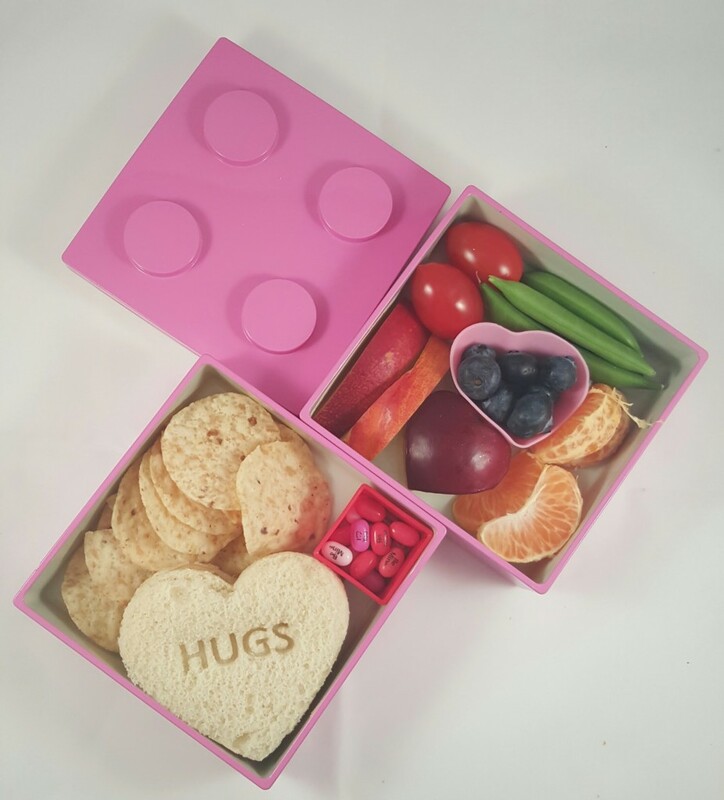 I used our very cute pink Lego-like bento box for it and included some Tic-Tacs in the tiny red box with Valentine’s Day phrases. The lunch below was packed for my husband. 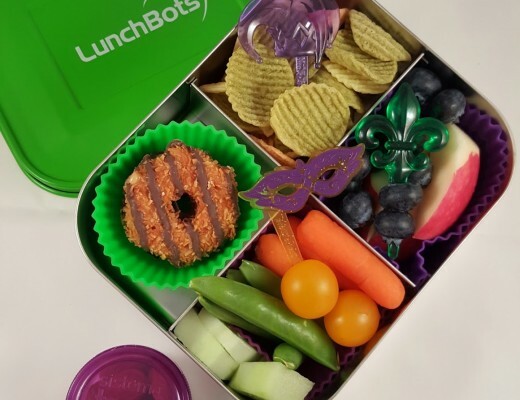 I wish I could still find the cracker/chips that were in this lunch. They don’t seem to make those anymore, but they were great for mixing things up in the lunch routine. 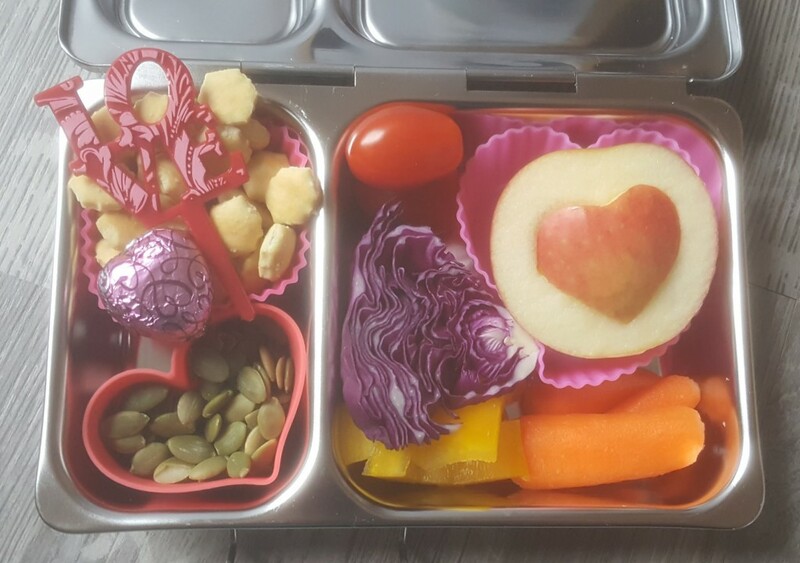 The lunch below was for my daughter from two years ago. I wish stores near us still sold packs of frozen macarons. 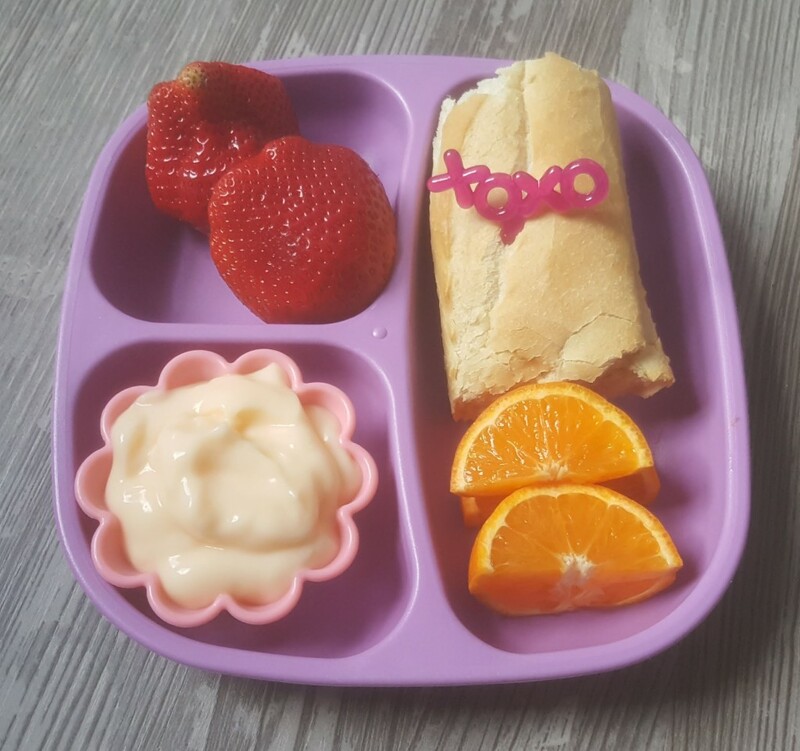 My kids love macarons and the frozen packs were great because I could store them in the freezer for a few weeks and just add one to a lunch every now and then for a treat. 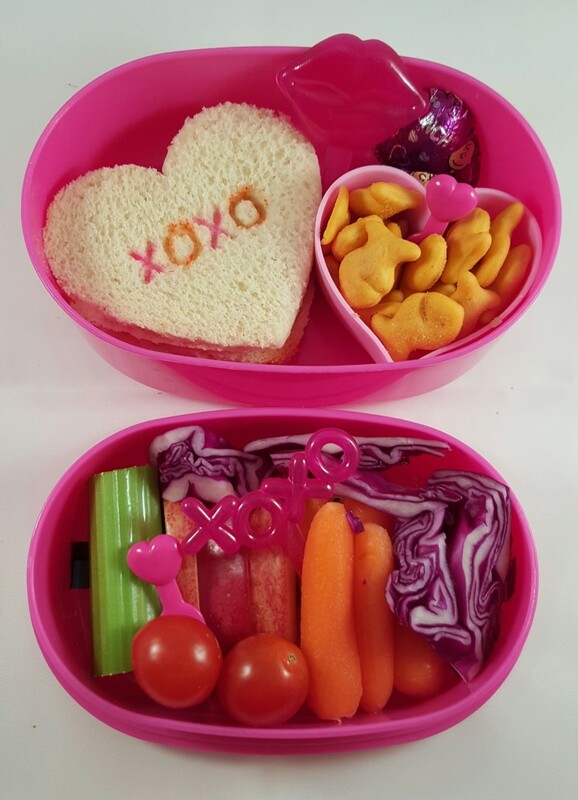 I included a Lunchbox Love note with this lunch. The lunch below was for my son. Neither of my kids were eating sandwiches at the time these were packed. They were younger and had smaller appetites. 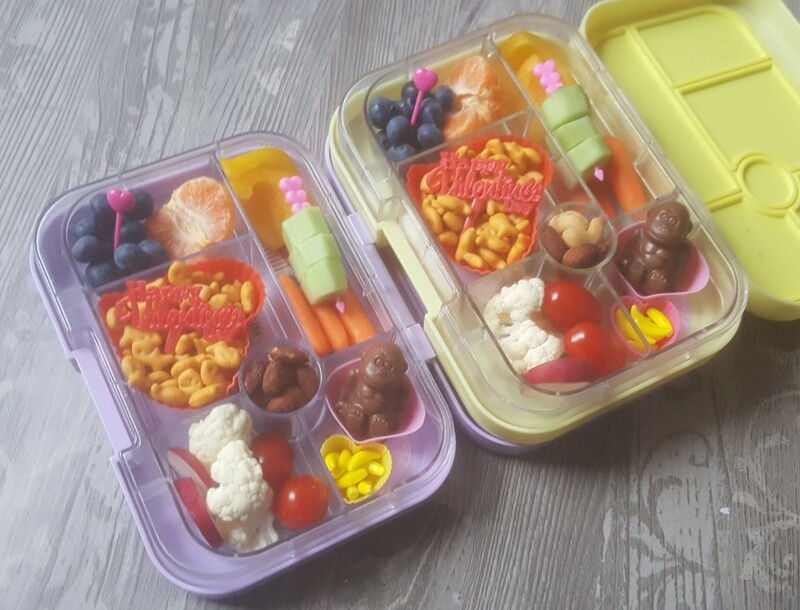 Both of these were packed in the original style Yumbox boxes which hold less food than the style I most commonly use now. The lunch below was from last year. It was packed in our Planetbox Shuttle. 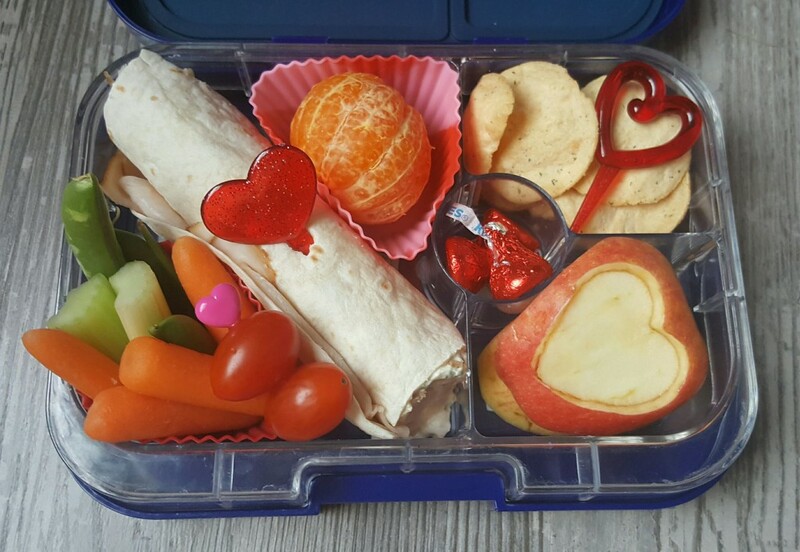 My kids had matching lunches on this day. They were both enjoying mini oyster soup style crackers and pepitas at the time. The lunches below were also from last February. 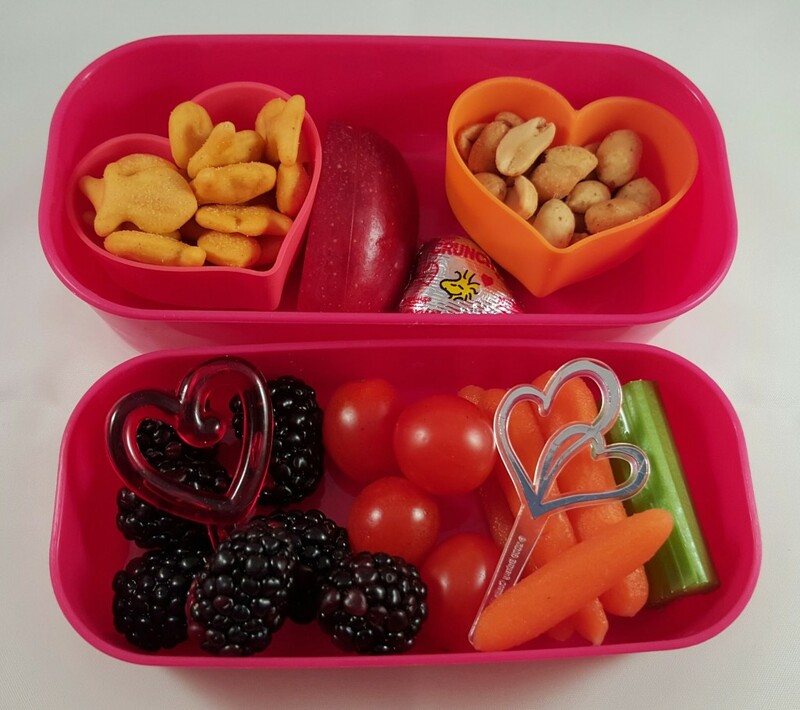 Occasionally, my husband finds cute things for me to add to lunch themes. For these, he had found cute chocolate apes which I built into a “Bananas about you” lunch theme for Valentine’s Day. The lunch below was for my husband. 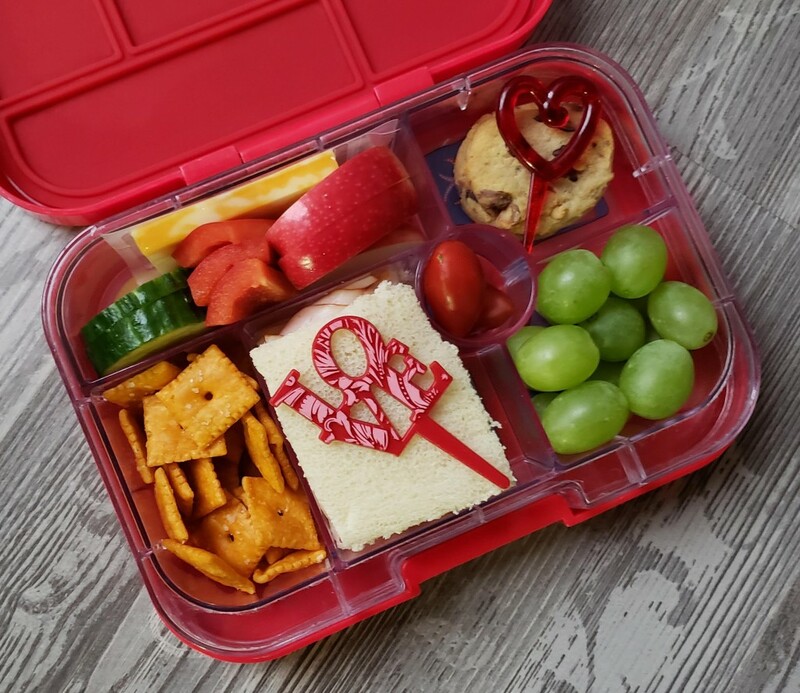 Those cupid’s heart picks are easy to add to a lunch for a cute touch. The next few lunches were packed awhile ago. 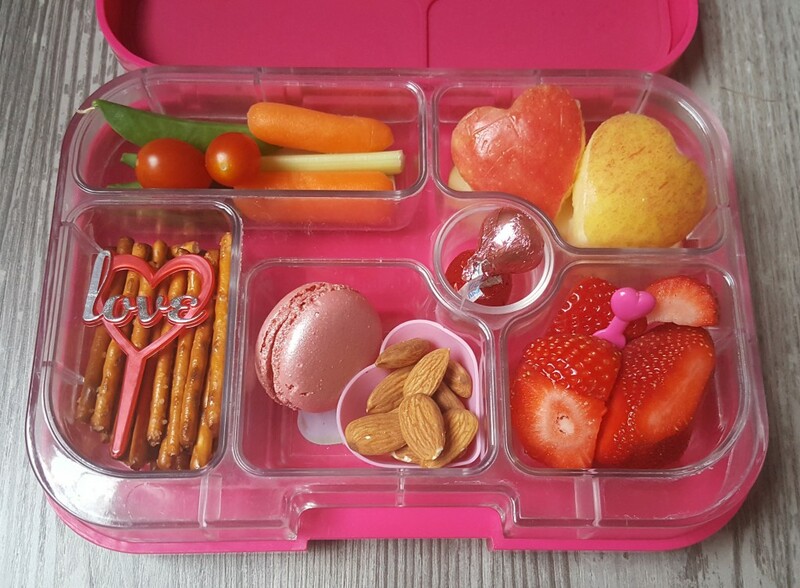 The one in the pink bento box below was for my daughter. 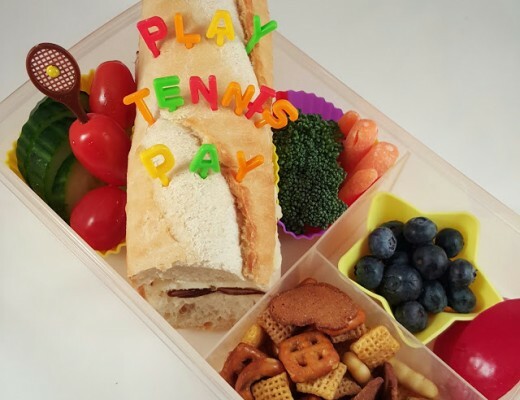 The one in the red bento box below was for my son. 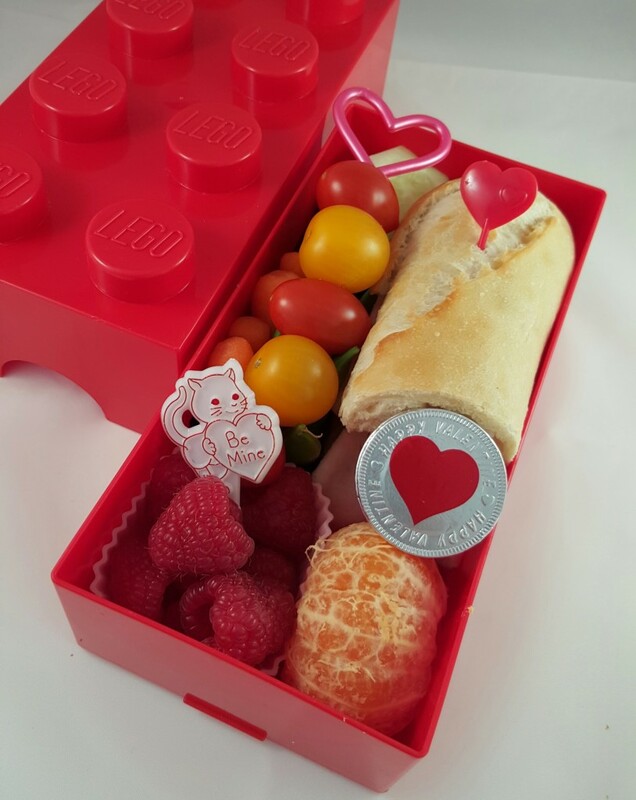 The lunch in the red Lego bento box below was for my husband. The lunch below was for my daughter. I think that red bento box got sacrificed to her slime fascination this past year. Lots of my boxes ended up in her room filled with homemade slime. Next is a lunch my daughter had today. It included a mini key lime cheesecake as a special treat to brighten the start of her week. This was packed in a bento box we just got this year. It’s been a good size for her current appetite. 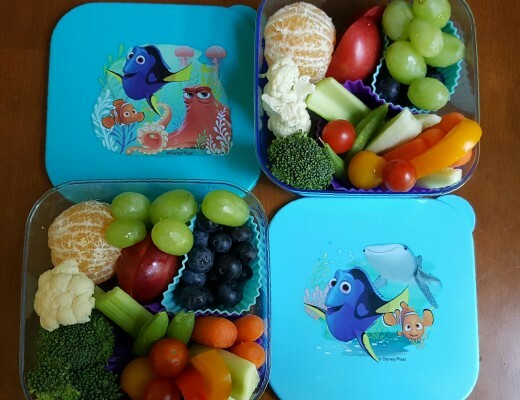 It’s also an inexpensive lunch box for trying if you are just getting started in this style of lunch packing. I’ll end this post with three Valentine’s Day themed breakfasts I made. 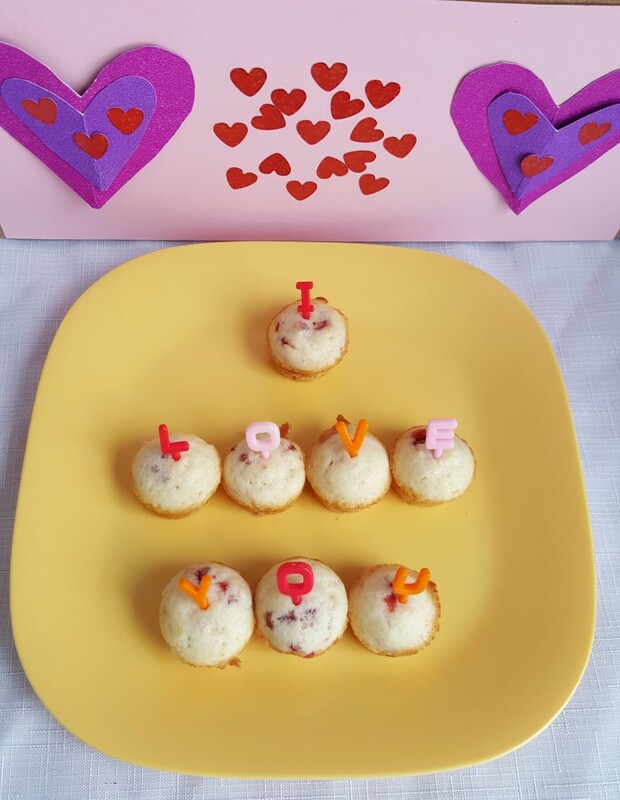 First is one with a message on mini muffins. Next is a breakfast my son had that included yogurt and warm baguette – two of his favorites. Last is a breakfast my daughter had. These last two were served on plates by Re-Play meals. We use these a lot at home. Thanks for reading. 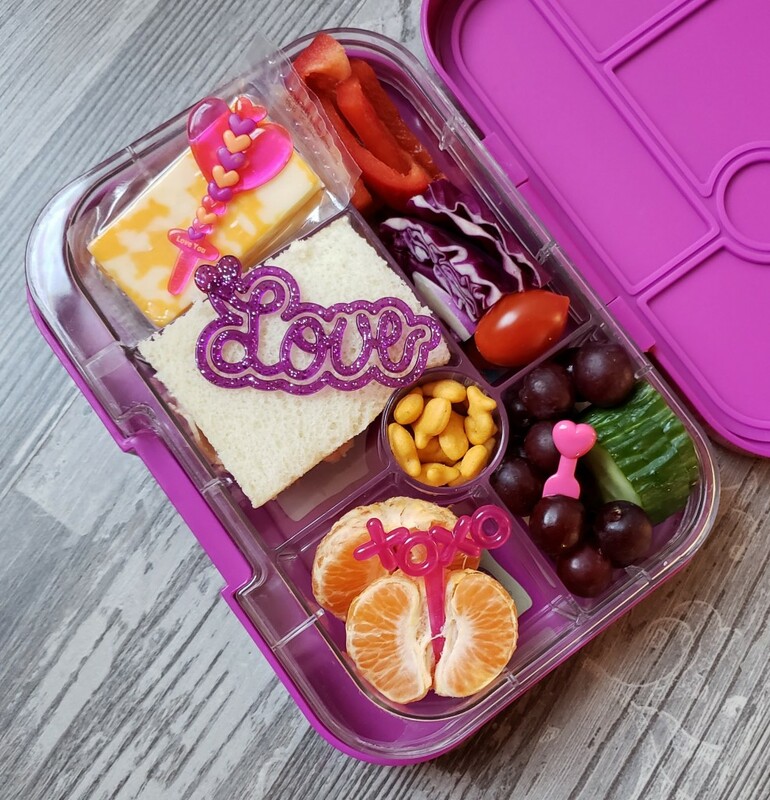 I hope you enjoyed seeing all of these love packed meals.